So, the nominations for Time magazine’s Person of the Year are out. When did they start releasing nominations prior to the announcement of their choice? This seems like a bad idea. I know that, ultimately, the magazine’s editors are still deciding who gets the title, but why even let people pseudo-vote on this? Why even allow for the possibility of the public influencing editorial decision-making? Besides, we all know how this is going to go. Stephen Colbert proved long ago the futility of asking the Internet’s opinion about anything. If Time had shown me the list of nominees beforehand I could have told them who would end up dominating in the Facebook “Like” race. Isn’t that right, Little Monsters? Don’t get me wrong, I’m not naive; I realize Time is just doing this to drive page views, and obviously it’s working. I just clicked through all twenty-something pages of the gallery. Congratulations, Time! That doesn’t stop me from being annoyed by the whole thing, though. Also annoying to me, and likely to Time as well, is how people constantly misunderstand what this even means. It’s not a commendation; it’s supposed to go to the biggest newsmaker or the person with the most influence, positive or negative, in that calendar year. 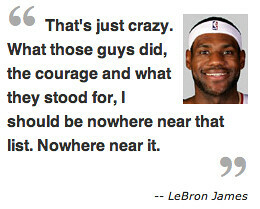 No, LeBron, this isn’t some sort of global MVP award, you don’t need to be falsely humbled to be included along with the Chilean Miners. Someone should tell him that one of his fellow nominees is Tony Hayward. Hey, remember Jenny Slate? From Saturday Night Live? Most famous for dropping an F-bomb in one of her first sketches? Unfortunately, she didn’t get to do much else during her short tenure on the show. It’s too bad that she didn’t get much of a shot. She’s funny and charming, and I was excited to watch her on the show after seeing a bunch of the videos she made with Gabe Liedman before being added to the cast. Well, she appears to be doing quite well post-SNL. She co-wrote the adorably hilarious (hilariously adorable?) short film “Marcel the Shell with Shoes On” (and voiced Marcel), which got some ink in Entertainment Weekly. And now she’s making more videos with Gabe Liedman! Here’s the first of their “Bestie x Bestie” series, of which there are currently three, all well worth watching. I’ve long been of a defender of Abby Elliott, but even I must admit that if SNL only had enough space for one of them, Ms. Slate deserved the paycheck. I’ll ask again: What is going on with Sesame Street? I’m not complaining. I would never complain about having more Ricky Gervais in my life. But I’m a bit confused. Kids don’t even know who Ricky Gervais is, right? Unless maybe they are really big Flanimals fans? As I often wonder about Pixar movies (again, not complaining, I love Pixar), at what point are we worrying more about entertaining adult viewers of children’s entertainment than we are the actual children? It seems weird to have Sesame Street parodying Mad Men and True Blood. Oh well, I don’t have kids. Perhaps in response to my previous post about Daft Punk doing the TRON: Legacy soundtrack, my friend Paul sent me a link to the following video. It starts a bit slow but then, at the one minute mark, becomes one of the greatest things I’ve ever seen in my life. If I were trying my best to combine two things I love to make something that I REALLY love, it would have taken me years to come up with a Cosby Show and Daft Punk mashup. The person who made this is a visionary. This is like someone getting his chocolate in someone else’s peanut butter or vice versa. Seriously, though, why is that girl walking down the street eating a huge tub of peanut butter? House candidate loses a supporter he never really had. Mediaite has picked up on a story that I think is slightly funny about a candidate for the House of Representatives named B.J. 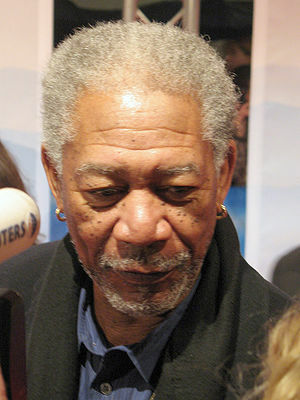 Lawson who claimed Morgan Freeman had narrated a campaign ad for him. And then Morgan Freeman said it wasn’t really his voice. And then a bunch of people called each other liars. Or something. My main interest in this story is that this is my House district! I voted against this guy! There was even a supporter of his at my polling place. On the way out, he said “Thanks for voting, even if you don’t look like you voted for my candidate.” Keen eye, sir. Deadspin points out that tomorrow is the tenth anniversary of ESPN.com’s Page 2, which has me reminiscing about my time spent online over the past decade. Page 2 was, at least for sports, the first source of online, well-written, free-wheeling opinion pieces that I read, I think, and I would suspect it contributed quite a bit to blogging culture as we now know it. I was familiar with David Halberstam, but I’m pretty sure I hadn’t ever heard of Hunter S. Thompson before he started writing for ESPN, which is a really bizarre way to be introduced to him. And, of course, Page 2 introduced us all to Bill Simmons, who would eventually become a sports media behemoth and perhaps the premier star over at ESPN. I can’t believe I’ve been reading him for ten years. That sort of explains why he seems so old and vaguely out of touch lately. Anyway, I like to make fun of ESPN, and I’ve certainly had a few laughs at Page 2 over the years, but here is just one more example of the network being ahead of its time. As if introducing the idea of 24-hour sports and fueling adoption of HDTV (and maybe 3D TV) weren’t enough. Kudos, Worldwide Leader. It seems wrong to say this should be the official video, considering the original features Christina Hendricks, but this homemade mashup of the Hall and Oates video for “Private Eyes” and the Broken Bells song “The Ghost Inside” is great. They should be playing it on MTV or Fuse or wherever they play videos nowadays. Actually, I guess the only place anyone watches music videos anymore is YouTube, so mission accomplished! It’s uncanny how well this works. Surely we can get John and Daryl to sign over the rights; they’ve got nothing going on.